The stars of this ice cream are actually Strawberries and Cream, it is more of a Strawberries and Cream Ice Cream, and it is as good as it gets. 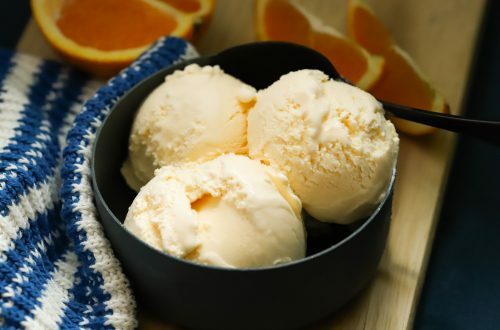 Making homemade ice cream with fruit is quite challenging in general, as the fruit may vary in ripeness and taste, greatly affecting the final outcome of the ice cream’s taste and texture. For this reason, you ought to choose in-season, locally grown and well-ripened strawberries. They should have a sweet taste when eaten plain and a deep red colour when bitten through. 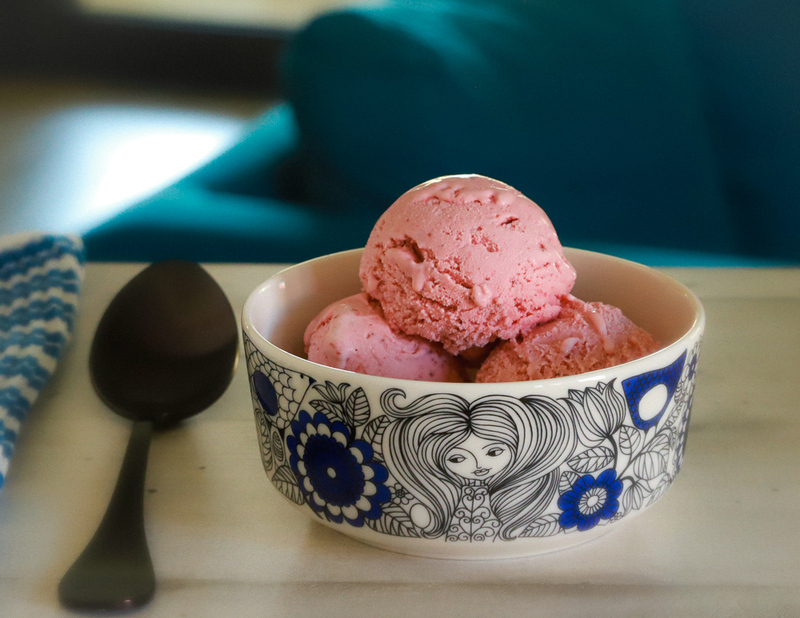 If your strawberries are packed with flavour, so will your ice cream. As for the seeds, you may want to strain it to remove them or you may not, it is totally up to you. In this recipe I add freeze dried strawberry powder, to enhance the strawberry flavour. It is totally optional, enhance the strawberry taste so much, that I strongly recommend you using it. If you are wondering why not add extra strawberries for extra taste, the reason is that the excess water of the fresh strawberries would outbalance the ice cream formula, making it icy instead of creamy. Freeze your ice cream machine’s container at least 24 hours before the time you plan to churn the ice cream. 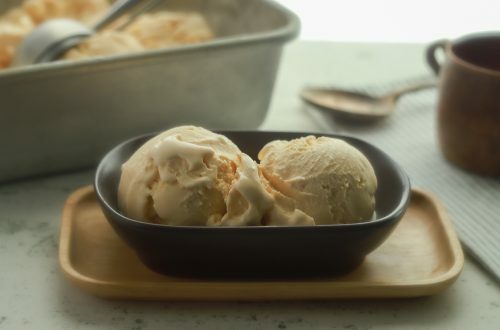 Make the ice cream base 12 hours before the time you plan to churn the ice cream. This batch is for an ice cream maker of 1.5 liter/quart capacity. Slice the strawberries. Put them in a bowl and add the 50 gr ( 1.7 oz )sugar. Stir with a silicone spatula for the sugar to coat the strawberries. Leave to soften for 2 hours, stirring every half an hour. Set a mesh strainer over a medium saucepan. Pour the strawberries into the strainer, along with any residue of sugar and juice. Give the strawberries in the mesh strainer a stir to help release as much liquid a possible. Leave them to sizzle for 1 minute, then turn them around with a spatula and leave for 1 minute more. Put them again in the strainer over the medium pan, along with any juices left in the pan. Stir and leave to capture as many juices as possible. Tip: Before removing the mesh strainer from the pan, wipe it underneath with the silicone spatula to collect in the pan all the juice that is stuck there. Put the strawberries in a blender and blend. Set the mesh strainer over a large, clean bowl and pour the blended strawberries over it (you may want to omit this step if you like to have the seeds in the ice cream. Pour over 250 gr ( 8.5 oz ) of the heavy cream, stir well and set aside. Give a rinse to the mesh strainer to remove the seeds, wipe well to dry and put it again over the bowl. Put the corn flour in a cup or small bowl. Start pouring some of the milk (around 50 ml; 1.5 oz) over it, while whisking with a fork to obtain a thick, lump-free slurry. In a separate, medium bowl add the egg yolks and set aside, having a whisk ready alongside. Put the medium pan and the juices over medium to high heat and bring to a boil. When it starts boiling, count 2 minutes and remove from the heat. Add the 130 gr ( 4.6 oz.) sugar, stir to dissolve and then add the rest of the milk, the buttermilk and 150 gr ( 5 oz ) heavy cream. Warm over medium heat, stirring occasionally to dissolve the sugar. When it is hot and steamy, remove from the heat and pour a small amount slowly over the corn flour slurry, whisking to dissolve the slurry. Pour it back into the saucepan, scraping the cup with the spatula, and warm over medium-high heat, stirring constantly with a silicone spatula till it starts to thicken and bubble up. If you are using an instant-read thermometer, it should register 90°C / 194°F. Remove from the heat and immediately pour over the egg yolks, while whisking continuously. The milk is hot enough to pasteurise the egg yolks, so do not worry about eating raw eggs. Pour everything through the mesh strainer. Remove the strainer, add the freeze-dried strawberry powder and stir with a silicone spatula. Prepare an ice bath, place the bowl with the ice cream base inside and let it cool completely. Stirring always helps it to cool down faster. You will need a large bowl, larger than the bowl with the prepared ice cream base. Put in some ice cubes and cold water. Carefully nest the bowl with the ice cream base in it. Pour more cold water from the sides, till it is level with the surface of the ice cream base in the inner bowl. Take extra care not to spill any water into the ice cream base. Alternatively, first nest the bowl with the ice cream base into the empty larger bowl. Fill the sides with ice cubes and cold water, taking care not to let any water spill into the bowl with the ice cream base. This is my preferred method, as sitting directly on the bottom of the bowl, rather than sitting on ice cubes, is more stable. When the ice cream base has cooled, pour into a container and close with a lid. Leave in the refrigerator overnight or up to 2 days. Prepare the ice cream machine according to the manufacturer’s instructions. With the machine running, pour the chilled ice cream base through the canister and into the ice cream machine. Leave to churn until nice and fluffy. Remove the machine from the container and put the container along with the lid into the freezer. Leave for 3-4 hours for the ice cream to properly set, before serving or removing to another container. This ice cream is thick due to the presence of so many solids (strawberries and cream), so it freezes hard in the long term. To soften it before serving, remove from the freezer and put it in the refrigerator for one hour before serving. Thanks to it’s texture, it is perfect for making ice pops or ice cream cake, just use it within 4 hours after churning so that it is still malleable. Do not let it sit in the freezer for more than one month. Still wondering how to melt this Camembert?